We are five days away from the Great Big Summit and there is still lots to do. Yesterday, after one final read through the Plan by a team-member, we pressed send and shipped it off to the designer to tighten up the layout. I went through my list. Agenda. Done. Except for tightening up the wording on the last item. At a Glance. In review, ready for print tomorrow. Attendee packages. Final copy ready for printing. Website. Design approved. Ready for final copy today and tomorrow. Video. Final shoots today. Edit over weekend. In one month, we have managed to pull together the pieces of what we hope to be an inspiring event on Tuesday. An event that will galvanize community around the vision of ending homelessness, and spark collective impact in getting the job done. Last night, just before leaving the office, I stepped into the CEOs office to check on the change I’d made on the agenda. “I don’t think I’ve quite got the wording right,” I told her. “Thanks. I just can’t quite hit on how to phrase this one,” I replied. I let my need to find the perfect turn of phrase go. I’m part of a team. That’s the beauty of collaboration. Cooperation. Community. Ending homelessness is a shared vision. It improves the lives of everyone. Not just those living beneath its burdens, but all of us in community. The other day I received an email from a property manager asking how to deal with ‘vagrants’ hanging around a strip mall they’ve just taken over managing. In my email response, I did not use the word vagrant and chose instead to educate with words that described homelessness as a societal condition affecting human beings. I also gave her the telephone number of the police district office and suggested she speak with the Community Resource Officer. I could do that because I know I am not alone. Ending homelessness is a collective responsibility. Here in Calgary, our police service has taken a proactive approach to working with communities to help mitigate the impact of those who struggle with homelessness in their community and those living with the experience of homelessness in their communities. They don’t take an us versus them perspective. They work inclusively with agencies, communities, businesses, faith groups and individuals to find mutually supportive solutions. And then rhyme off an incident they witnessed where maybe, compassion and inclusivity were not the key operational terms of reference. But the fact is, just as I am not alone, and the CHF is not alone in ending homelessness, and the person experiencing it is not alone in ending homelessness, neither is the police service. They too rely on each of us, on businesses, individual citizens, communities, everyone to do their part. And part of what we all need to do is recognize our role as a collective. There is power in our shared vision of ensuring homelessness does not continue to destroy lives and undermine community. As long as we get our ‘buts’ out of its possibilities, we can do it. There are many possibilities in ending homelessness. The possibilities are limitless when we share in the power of our collective impact and move beyond the reasons why we can’t. We’re launching the update to the Plan to End Homelessness on Tuesday. It’s not CHF’s Plan. It’s not my Plan or her Plan or his. It’s ours. You can play a role. Come to the Great Big Summit on Tuesday and find out what you can do to make a difference. Everyone is invited. There’s no cost to attend. But there is one if you don’t. And that is the one that costs the most. Your voice will not be part of the agenda. Your difference will not be felt. And we will not have the same collective impact without you. Categories: Homelessness, Make a difference | Tags: 10 year plan to end homelessness, CHF, collective impact, community development, ending homelessness, great big summit | Permalink. The Happy Trails gang give back joy and laughter. In 1912 when vaudeville performer and trick-roper Guy Weadick arrived in Calgary to stage an outdoor rodeo competition that was also designed to preserve the values and romance of the ‘old-west’, I doubt he had any idea how big and amazing the event would become. Today, billed as The Greatest Outdoor Show on Earth, the Calgary Exhibition & Stampede (or The Stampede as it’s called by most Calgarians) attracts over a million visitors every year and along with some healthy purses for the winners of the various events, it provides volunteer opportunities for over 5,000 people a year. When my brother-in-law, JT, retired several years ago, he was looking for something to fill his time and his desire to give back to community. He signed up to become a volunteer with the Stampede. Today, he and his fellow posse in The Happy Trails Gang, visit locations all over the city, and environs, celebrating the spirit of the west while providing onlookers an opportunity to clap their hands, sing-a-long and maybe even do a two-step or more. From September to May, they turn up with their “Happy Trails” show every last Tuesday of the month at various seniors’ lodges around the city. Last night, JT and his gang rode into the lodge where my mother lives to turn up the music and get down to some good ‘ole country twang. My sister Jackie and I trailed along, as did my beloved, C.C., and while I had a great time listening and clapping along, what struck me most was the pure joy and passion of JT and the other members of the gang. They take their Stampede spirit seriously and share it generously. The Stampede Queen and Princesses were also there, as was Indian Princess, Maya Many Grey Horses in her stunningly beautiful beaded traditional dress and moccasins. The young women, whose role it is to act as ambassadors for the Stampede, and for Maya, the Indian Village, circulated amongst the crowd, sitting to chat with the seniors, to dance and to sing along. They even lead a couple of line dances and took the mic to sing a couple of tunes together! 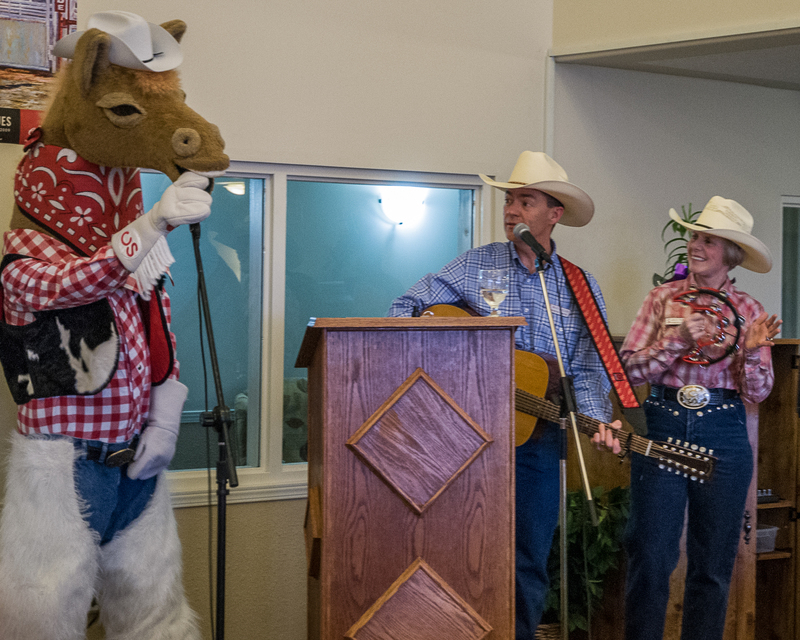 Harry the Horse, the 30-year-old mascot for the Stampede also turned up and flirted with the women, got up to some of his playful antics and lead the crowd in boisterous Yah Hoo!s that bowled him over with their fervour, garnering a big cheer from everyone in the room. When we stopped to grab a bite to eat afterwards, both C.C. and I reflected on how joyful an evening it was and how everyone felt wrapped up in the warmth and energy of the Happy Trails Gang. Which brings me back to the spirit of giving. There were over 15 members of the Happy Trails Gang there last night along with at least 4 people accompanying the Stampede Royalty and Indian Princess and Harry the Horse. All of them volunteers. Giving back makes a difference. To the receiver and the giver. At the end of the evening, JT introduced us to the man on the committee he calls, ‘my mentor’. “We’re best buds,” his mentor exclaimed as he bent down to kiss my mother’s cheek and give her a gentle hug. As we left, one of the residents of the lodge called out a joyful, “Good night” to anyone within hearing distance as she pushed her walker towards the elevator. I’ve never heard that happen after any other event at the lodge. And that’s the spirit of Stampede. It allows people to connect, on a deep, whole-hearted level to values we all hold true, but values that sometimes get forgotten or stepped on in the busy-ness of every day living. Community. Loyalty. Sharing and having fun. I spent a couple of hours last night surrounded by people committed to giving back to community. Their willingness to share smiles, laughter, good spirits and joy was contagious. I’m richer today because of their giving back. Thanks JT and everyone with the Happy Trails Gang! You make a difference. Categories: Make a difference | Tags: Calgary Exhibition and Stampede, Calgary Stampede Queen and Princesses, giving back, Greatest Outdoor Show on Earth, Guy Weadick, Harry the Horse, Indian Princess Maya Many Grey Horses, Promotions Committee, volunteering, volunteering with the stampede | Permalink. When I unpacked the new toothpaste tube from its box I grumbled. I’d bought the wrong one! I actually had to unscrew the top not flip it open. Really? That’s going to take me seconds more! And it requires two hands. And I’ll have to put the lid back on too! Everyday I encounter big and small problems that cause me to grumble and gripe in silent sufferance of their presence in my first world existence. I forgot to stop at the grocery store on my way home to pick up milk for my coffee in the morning. The hot water is taking too long to get through the tap. I forgot to take out the laundry from the dryer. The driver in front of me didn’t signal he was turning left and now I have to wait until he clears the intersection. What if I don’t get through this light? That pedestrian walked on the flashing orange. Doesn’t she know she’s not supposed to? She’s making me wait. In every life, we have grumbles and gripes that ruffle up the waters of our sailing smoothly through each day. It’s not that we’re looking for trouble. It’s just we don’t have time for these irksome little issues that pop up and slow us down or distract us from getting on with what we’re doing because, don’t you know? We don’t have time for this! And seriously. Can’t the rest of the world see that what we’re doing is more important than someone else getting where they want to go. That their having what they want to have comes after me getting what I want? That their doing what they need to do is not as important as my ‘to do list’? Life is a journey of interdependence and cooperation. It takes all of us to keep the peace. All of us to create it too. And it begins with the little things in our world. It is not that serious an offense to buy ‘the wrong’ kind of toothpaste. But that fissure of irritation that rippled through my mind when I discovered what I’d done, that did create discord in my being. Until I moved to gratitude. I am grateful I have choice when I go out to buy my toothpaste. I am grateful I have a job I love that provides me the money with which to buy it. And I am grateful for the reminder that I can take my good fortune for granted. I am grateful there are traffic lights to govern traffic flow, and that people adhere to them making it safe for everyone to drive on the roads. I am grateful that person got to cross the intersection without getting hit. That they trusted me enough to know they didn’t have to fear my running them over. Sure, they’re ‘not supposed to’ cross on the flashing orange. It’s not a big wait to let them get safely to the other side. And truthfully… Don’t I sometimes rush across the intersection on the flashing light when I’m walking too? Don’t I rationalize when it’s okay for me to do it? I am grateful for the opportunity to see where my actions are not congruent with my thinking. I am grateful I have the choice to do better, to change my actions, to see the parallels in what I do and what others are doing too. It reminds me, we are all on this human journey together. If I’m going to carry anything to help me get through my day in grace, let it be tolerance, compassion and gratitude. Let me let go of gripes and grumbles and turn instead to gifts and gratitude. What a gift to be able to have choices, to have hot and cold running water, a fridge to keep my milk cold, and a store to go to when I run out. What a gift to be able to drive to the store so I don’t have to carry heavy groceries too far. Let me see the gifts in every moment of my life and give thanks for all its possibilities. Let me let go of gripes and fill my heart with gratitude. 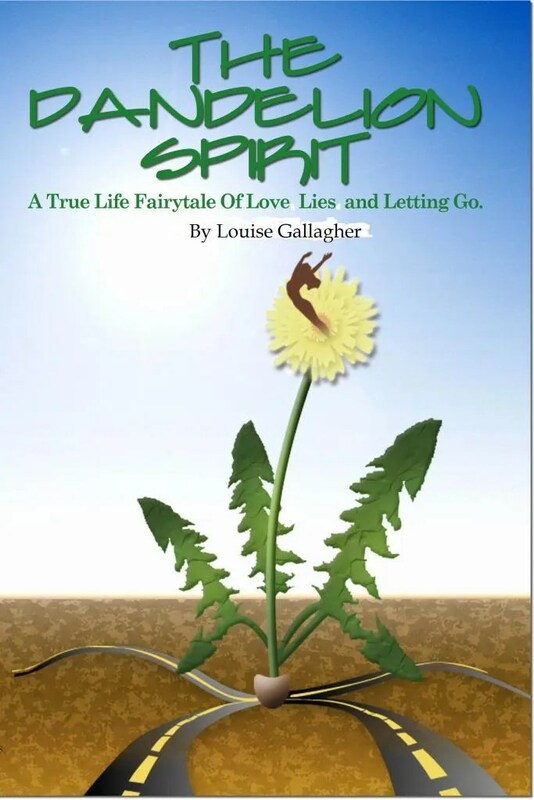 Categories: Essential Journey | Tags: letting go of gripes, living with grace, living with gratitude | Permalink. 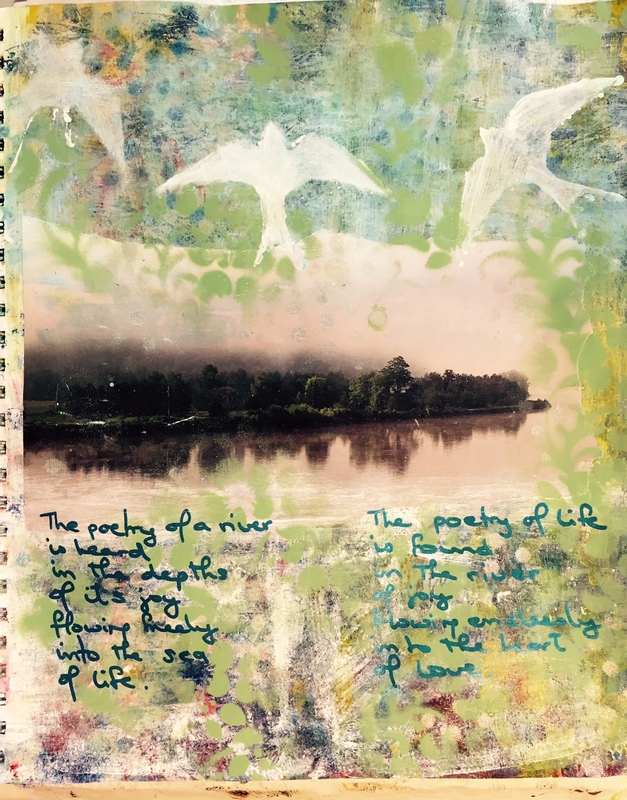 Val Boyko writes beautiful and enriching words on living life in the balance of all things at her blog, Find your Middle Ground. Last week she shared a delightful acronym for the word STOP in her post, STOP and Find Balance. O = Observe… What am I aware of right now? … What is alive in me? Can I be with it whatever is coming up right now. I don’t work Fridays. By design my work-week is four days. As I’ve got so much to do right now, however, taking Friday’s off is not my choice. Which means, I need to STOP more often to find myself amidst all the lovely things on my plate because, no matter how lovely the things, I can get lost in the busy-ness of it all. C.C. plays hockey Friday afternoons and afterwards was watching the NHL game with team mates. When I got home I had the house to myself and in the quiet of it all found myself immersed in the joy of creation in my studio. Saturday, I had intended to work on the final proof of the report we need to have printed this week, but I didn’t have the final version back yet, so let my plans go. I spent a bit of time cleaning up some work I needed to do and then, once finished, slipped back down to the studio to keep playing. Yesterday, still no final proof and a great opportunity to keep creating. 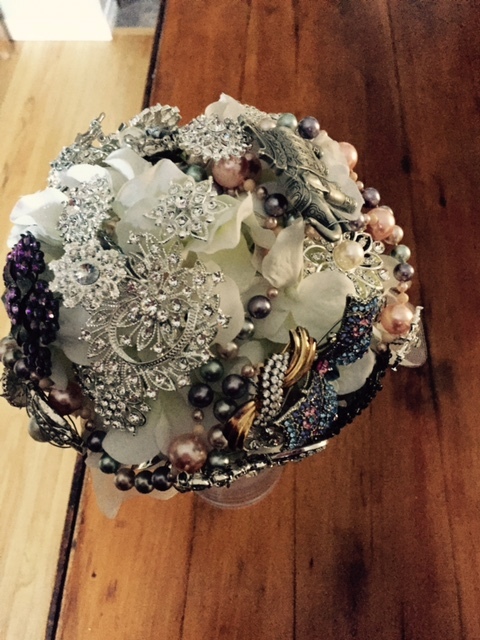 But, rather than paint, I worked on the brooch bouquet I’m creating for our wedding. If you’ve never seen a brooch bouquet, check out Pinterest ideas. They’re stunningly beautiful and as in the case of my bouquet, have meaning. Some of the brooches I’m using were contributed by family and friends. There’s an elephant my sister gave me years ago, one from my father’s sister, another from the wonderful Kerry Parsons who will be officiating at our wedding. I’d started working on the bouquet after Christmas and was stalled in that space of chaos in the middle of creation — the not finished project hasn’t had enough space to breathe and my head wants to tell me to give up. It is quite time-consuming as each brooch needs to have two wire stems affixed and spun together to create enough stability to hold their place in the bouquet. The process is meditative. 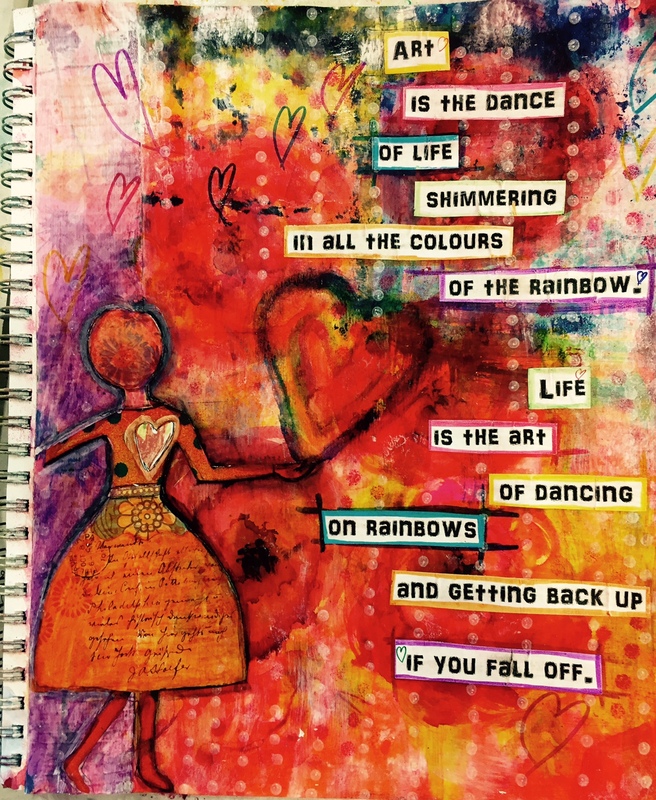 As I worked, I felt myself settling into the rhythm of creation, and even though I was watching “Romancing the Stone” 🙂 on Netflix, I found myself slowing down, I felt my breathing deepen, my heartbeat quiet. I listened deeply to my heart yesterday. As I wired and spun and worked to create a thing of beauty to carry on our wedding day, I rejoiced in the wonder and awe of walking in love. As I carefully constructed the bouquet, I cherished the memories of each piece of jewelry and savoured the essence of the person who gave it to me and the gift of carrying them in my heart, and hands, today and every day. It still needs some work to find its balance, some added space fillers to find its symmetry. But I’m happy. It is, like all things creative, a work in progress. Categories: Essential Journey, Marriage, The Creative Journey | Tags: acronym for STOP, brooch bouquet, find your middle ground, Kerry Parsons, Val Boyko | Permalink. I had written to apologize for having to back out of my commitment to coach at Choices next week. I hadn’t wanted to, back out. I absolutely love coaching at Choices and am privileged to be able to do it as often as I do. I won’t be there in April because of the wedding, and was telling myself I would be letting the whole team down if I didn’t turn up as I’d committed to this time. And then, lying awake in the dark, trying to rosy up my glasses so I could peer into the darkness of my thinking that I was sinking beneath the juggling of all the things I had to do, I realized, it’s not true. I don’t have to do it all. Sometimes I can’t. Sometimes, I have to trust it will be okay. So I wrote and let Mary know I couldn’t be there. And still, I worried. What would she think of me? Maybe her disappointment in me would lead her to reject me. Maybe everyone would be mad at me and never want to work with me again. Ahhh, that critter is such a sneaky fellow. He knows I have trust issues, heck he feeds them all the time! So imagine his glee when he realized I was tripping over myself, lost in a sea of angst? HA! Gotcha! he shouted as he catapulted into a new assault of my senseless worrying about what other people think of me. True to form, when faced with even a glint of what he perceives to be my failure to heed his advice, he morphs into a new and slimy perspective designed to keep me playing small in the eye of his hurricane-force howling telling me I am a failure. I don’t belong. Gosh, I sure can get caught up in my own darkness, and drama, when I take my sights off the truth. I’m okay. In fact, I’m wonderfully, lovingly humanly okay. I really did think it was my job to cram it all in, juggle it all and keep the world spinning. Mary’s gentle and loving response to my email stopped my thinking in its tracks. I was seeing the totality of all I had to do and losing sight of the loveliness of all I had to do. I was trapped in the dark side of my thinking it was all up to me and not seeing the loveliness and joy of all I am excited about doing. I have a lot of lovely things on my plate. Some of them include organizing a media training day for executives in the homeless serving sector in March and working with an amazing team on the launch of a Homeless Charter of Rights in April. My beloved and I are also planning our wedding for April 25th and over the past few months, I have had an amazing time creating for it. And, this project of launching Calgary’s Updated Plan to End Homelessness at the Summit on March 3rd. It is exciting, inspiring, uplifting. We are in the throes of paradigm shifts and igniting collective impact. It’s amazing! And there I was bogged down in the minutia of the ‘I’ve got to do it all’ and losing sight of how I can trust others to be doing their best too to change the world. My glasses were foggy. I changed them. It was me, myself and I getting in the way of my seeing the truth — Next week at Choices, there will be a whole team of loving, caring, committed individuals doing the wonderful work of Changing the world one heart at a time. My difference will be felt here, at the nexus of working towards a goal I believe is important to the quality of life of every Calgarian — ending homelessness. I am truly blessed to have so many lovely things on my plate. Things that excite me and charge me up, that remind me every day — I can be the change I want to see in the world. Categories: Choices Seminars, Homelessness | Tags: changing glasses, changing the world one heart at a time, Choices Seminars, ending homelessness, plan to end homelessness | Permalink. I can’t remember where or when I read or heard the line, the poetry of a river, but I remember thinking, I must remember that, it’s beautiful. Last night, when I entered the studio to spend some contemplative time, the line appeared and the word/art flowed. I am grateful for the quiet. For the time to simply be present in front of a blank canvas or journal page. In the presence of its invitation to let creativity flow, my mind empties and I become full of wonder and awe at how easy it is to find my balance when I let go of holding onto the thought, ‘I must find my balance’. I am neither out of or in balance. I simply am where ever I am, living whatever label I give myself for where I am. In letting go of needing to find my balance, I find my path through the questions that are percolating on the edge of my consciousness. I am in a phase of extreme busy at work right now. I am planning a large event for 400 people for March 3rd, which entails not only planning for the event, but also editing, publishing, printing a large report along with a website and video. It is work I love but the timeframe to get it all done is very tight given that the date for the event was set at the end of January. It’s meant some busy days, and as is apparent by the time at which I’m writing, sleepless nights. Spending time in the studio is essential for me to keep balanced and present. Spending time in the studio is something ‘the critter’ would like me to avoid. Ever notice how critters and other nefarious voices have a definite style and place? Mine sits on my left shoulder, jumping up and down in its attempts to get me to pay attention, flinging its arms and flapping its tail as it whispers un-sweet ditherings into my ear. He likes to ensure he’s hard to ignore! Fortunately, I know what’s good for me even in the face of his insistence he knows better. 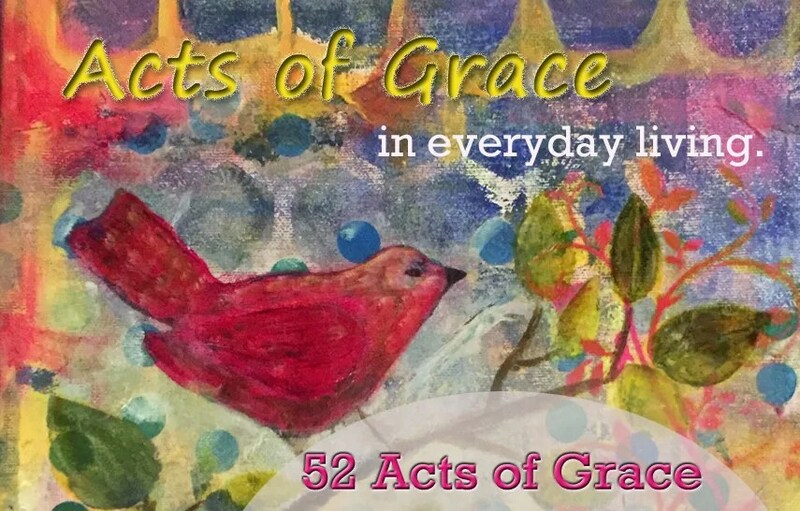 Fact is, when immersed in busy, I need to give myself the gift of time to create in order to let go of the pressure building on my list of ‘to do’s’ if I am to avoid the panic that sets in when thinking about all I have yet to get done. What’s your path to balance? Where do you go to give yourself space to be present? Categories: Art and creativity, Essential Journey | Tags: creativity, finding balance, letting go | Permalink.